Seventh president of the United States, born on the 15th of March 1767, at the Waxhaw or Warsaw settlement, in Union county, North Carolina, or in Lancaster County, South Carolina, to where his parents had immigrated from Carrickfergus, Ireland, in 1765. He played a slight part in the War of Independence, and was taken prisoner in 1781, his treatment resulting in a lifelong dislike of Great Britain. He studied law at Salisbury, North Carolina, was admitted to the bar there in 1787, and began to practice at McLeansville, Guilford County, North Carolina, where for a time he was a constable and deputy sheriff. In 1788, having been appointed prosecuting attorney of the western district of North Carolina (now the state of Tennessee), he removed to Nashville, the seat of justice of the district. In 1791 he married Mrs. Rachel Robards (née Donelson), having heard that her husband had obtained a divorce through the legislature of Virginia. The legislative act, however, had only authorized the courts to determine whether or not there were sufficient grounds for a divorce and to grant or withhold it accordingly. It was more than two years before the divorce was actually granted, and only on the basis of the fact that Jackson and Mrs. Robards were then living together. On receiving this information, Jackson had the marriage ceremony performed a second time. In 1796 Jackson assisted in framing the constitution of Tennessee. From December 1796 to March 1797 he represented that state in the Federal House of Representatives, where he distinguished himself as an irreconcilable opponent of President George Washington, and was one of the twelve representatives who voted against the address to him by the House. In 1797 he was elected a United States senator; but he resigned in the following year. He was judge of the supreme court of Tennessee from 1798 to 1804. In 1804-05 he contracted a friendship with Aaron Burr; and at the latter's trial in 1807 Jackson was one of his conspicuous champions. Up to the time of his nomination for the presidency, the biographer of Jackson finds nothing to record but military exploits in which he displayed perseverance, energy and skill of a very high order, and a succession of personal acts in which he showed himself ignorant, violent, perverse, quarrelsome and astonishingly indiscreet. His combative disposition led him into numerous personal difficulties. In 1795 he fought a duel with Colonel Waitstill Avery (1745-1821), an opposing counsel, over some angry words uttered in a courtroom; but both, it appears, intentionally fired wild. In 1806 in another duel, after a long and bitter quarrel, he killed Charles Dickinson, and Jackson himself received a wound from which he never fully recovered. In 1813 he exchanged shots with Thomas Hart Benton and his brother Jesse in a Nashville tavern, and received a second wound. Jackson and Thomas Hart Benton were later reconciled. In 1813-14, as major-general of militia, he commanded in the campaign against the Creek Indians in Georgia and Alabama, defeated them (at Talladega, on the 9th of November 1813, and at Tohopeka, on the 29th of March 1814), and thus first attracted public notice by his talents. In May 1814 he was commissioned as major-general in the regular army to serve against the British; in November he captured Pensacola, Florida, then owned by Spain, but used by the British as a base of operations; and on the 8th of January 1815 he inflicted a severe defeat on the enemy before New Orleans, the contestants being unaware that a treaty of peace had already been signed. During his stay in New Orleans he proclaimed martial law, and carried out his measures with unrelenting sternness, banishing from the town a judge who attempted resistance. When civil law was restored, Jackson was fined $l000 for contempt of court; in 1844 Congress ordered the fine with interest ($2700) to be repaid. In 1818 Jackson received the command against the Seminoles. His conduct in following them up into the Spanish territory of Florida, in seizing Pensacola, and in arresting and executing two British subjects, Alexander Arbuthnot and Robert Ambrister, gave rise to much hostile comment in the cabinet and in Congress; but the negotiations for the purchase of Florida put an end to the diplomatic difficulty. In 1821 Jackson was military governor of the territory of Florida, and there again he came into collision with the civil authority. From this, as from previous troubles, John Quincy Adams, then secretary of state, extricated him. In July 1822 the general assembly of Tennessee nominated Jackson for president; and in 1823 he was elected to the United States Senate, from which he resigned in 1825. The rival candidates for the office of president in the campaign of 1824 were Jackson, John Quincy Adams, William H. Crawford and Henry Clay. Jackson obtained the largest number of votes (99) in the electoral college (Adams receiving 84, Crawford 41 and Clay 37); but no one had an absolute majority, and it thus became the duty of the House of Representatives to choose one of the three candidates -- Adams, Jackson and Crawford -- who had received the greatest numbers of electoral votes. At the election by the house (February 9, 1825) Adams was chosen, receiving the votes of 13 states, while Jackson received the votes of 7 and Crawford the votes of 4. Jackson, however, was recognized by the abler politicians as the coming man. Martin Van Buren and others, going into opposition under his banner, waged from the first a relentless and factious war on the administration. Van Buren was the most adroit politician of his time; and Jackson was in the hands of very astute men, who advised and controlled him. He was easy to lead when his mind was in solution; and he gave his confidence freely where he had once placed it. He was not suspicious, but if he withdrew his confidence he was implacable. When his mind crystallized on a notion that had a personal significance to himself, that notion became a hard fact that filled his field of vision. When he was told that he had been cheated in the matter of the presidency, he was sure of it, although those who told him were by no means so. There was great significance in the election of Jackson in 1828. A new generation was growing up under new economic and social conditions. They felt great confidence in themselves and great independence. They despised tradition and Old World ways and notions; and they accepted the Jeffersonian dogmas, not only as maxims, but as social forces -- the causes of the material prosperity of the country. By this generation, therefore, Jackson was recognized as a man after their own heart. They liked him because he was vigorous, brusque, uncouth, relentless, straightforward and open. They made him president in 1828, and he fulfilled all their expectations. He had 178 votes in the electoral college against 83 given for Adams. Though the work of redistribution of offices began almost at his inauguration, it is yet an incorrect account of the matter to say that Jackson corrupted the civil service. His administration is rather the date at which a system of democracy, organized by the use of patronage, was introduced into the federal arena by Van Buren. It was at this time that the Democratic or Republican party divided, largely along personal lines, into Jacksonian Democrats and National Republicans, the latter led by such men as Henry Clay and John Quincy Adams. The administration itself had two factions in it from the first, the faction of Van Buren, the secretary of state in 1829-31, and that of John C. Calhoun, Vice President in 1829-32. The refusal of the wives of the cabinet and of Mrs. Calhoun to accord social recognition to Margaret O'Neill Eaton brought about a rupture, and in April 1831 the whole cabinet was reorganized. Van Buren, a widower, sided with the president in this affair and grew in his favor. Jackson in the meantime had learned that Calhoun as secretary of war had wished to censure him for his actions during the Seminole war in Florida in 1818, and henceforth he regarded the South Carolina statesman as his enemy. The result was that Jackson transferred to Van Buren his support for succession in the presidency. The relations between Jackson and his cabinet were unlike those existing under his predecessors. Having a military point of view, he was inclined to look upon the cabinet members as inferior officers, and when in need of advice he usually consulted a group of personal friends, who came to be called the "Kitchen Cabinet." The principal members of this clique were William B. Lewis (1784-1866), Amos Kendall and Duff Green, the last named being editor of the United States Telegraph, the organ of the administration. In 1832 Jackson was re-elected by a large majority (219 electoral votes to 49) over Henry Clay, his chief opponent. The battle raged mainly around the re-charter of the Bank of the United States. It is probable that Jackson's advisers in 1828 had told him, though erroneously, that the bank had worked against him, and then were not able to control him. The first message of his first presidency had contained a severe reflection on the bank; and in the very height of this second campaign (July 1832) he vetoed the re-charter, which had been passed in the session of 1831-32. 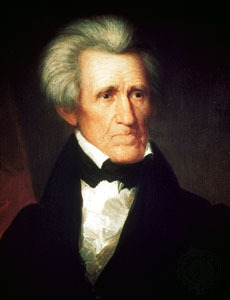 Jackson interpreted his re-election as an approval by the people of his war on the bank, and he pushed it with energy. In September 1833 he ordered the public deposits in the bank to be transferred to selected local banks, and entered upon the "experiment" whether these could not act as fiscal agents for the government, and whether the desire to get the deposits would not induce the local banks to adopt sound rules of currency. During the next session the Senate passed a resolution condemning his conduct. Jackson protested, and after a hard struggle, in which Jackson's friends were led by Senator Thomas Hart Benton, the resolution was ordered to be expunged from the record, on the 16th of January 1837. In 1832, when the state of South Carolina attempted to "nullify" the tariff laws, Jackson at once took steps to enforce the authority of the federal government, ordering two war vessels to Charleston and placing troops within convenient distance. He also issued a proclamation warning the people of South Carolina against the consequences of their conduct. In the troubles between Georgia and the Cherokee Indians, however, he took a different stand. Shortly after his first election Georgia passed an act extending over the Cherokee country the civil laws of the state. This was contrary to the rights of the Cherokees under a federal treaty, and the Supreme Court consequently declared the act void (1832). Jackson, however, having the frontiersman's contempt for the Indian, refused to enforce the decision of the court. Jackson was very successful in collecting old claims against various European nations for spoliations inflicted under Napoleon's continental system, especially the French spoliation claims, with reference to which he acted with aggressiveness and firmness. Aiming at a currency to consist largely of specie, he caused the payment of these claims to be received and imported in specie as far as possible; and in 1836 he ordered land-agents to receive for land nothing but specie. About the same time a law passed Congress for distributing among the states some $35,000,000 balance belonging to the United States, the public debt having all been paid. The eighty banks of deposit in which it was lying had regarded this sum almost as a permanent loan, and had inflated credit on the basis of it. The necessary calling in of their loans in order to meet the drafts in favour of the states, combining with the breach of the overstrained credit between America and Europe and the decline in the price of cotton, brought about a crash which prostrated the whole financial, industrial and commercial system of the country for six or seven years. The crash came just as Jackson was leaving office; the whole burden fell on his successor, Van Buren. In the 18th century the influences at work in the American colonies developed democratic notions. In fact, the circumstances were those which create equality of wealth and condition, as far as civilized men ever can be equal. The War of Independence was attended by a grand outburst of political dogmatism of the democratic type. A class of men were produced who believed in very broad dogmas of popular power and rights. There were a few rich men, but they were almost ashamed to differ from their neighbours and, in some known cases, they endorsed democracy in order to win popularity. After the 19th century began the class of rich men rapidly increased. In the first years of the century a little clique at Philadelphia became alarmed at the increase of the "money power", and at the growing perils to democracy. They attacked with some violence, but little skill, the first Bank of the United States, and they prevented its re-charter. The most permanent interest of the history of the United States is the picture it offers of a primitive democratic society transformed by prosperity and the acquisition of capital into a great republican commonwealth. The denunciations of the "money power" and the reiteration of democratic dogmas deserve earnest attention. They show the development of classes or parties in the old undifferentiated mass. Jackson came upon the political stage just when a wealthy class first existed. It was an industrial and commercial class greatly interested in the tariff, and deeply interested also in the then current forms of issue banking. The southern planters also were rich, but were agriculturists and remained philosophical Democrats. Jackson was a man of low birth, uneducated, prejudiced, and marked by strong personal feeling in all his beliefs and disbeliefs. He showed, in his military work and in his early political doings, great lack of discipline. The proposal to make him president won his assent and awakened his ambition. In anything which he undertook he always wanted to carry his point almost regardless of incidental effects on himself or others. He soon became completely engaged in the effort to be made president. The men nearest to him understood his character and played on it. It was suggested to him that the money power was against him. That meant that, to the educated or cultivated class of that day, he did not seem to be in the class from which a president should be chosen. He took the idea that the Bank of the United States was leading the money power against him, and that he was the champion of the masses of democracy and of the common people. The opposite party, led by Clay, Adams, Biddle, etc., had schemes for banks and tariffs, enterprises which were open to severe criticism. The political struggle was very intense and there were two good sides to it. Men like Thomas Hart Benton, Edward Livingston, Amos Kendall, and the southern statesmen, found material for strong attacks on the Whigs. The great mass of voters felt the issue as Jackson's managers stated it. That meant that the masses recognized Jackson as their champion. Therefore, Jackson's personality and name became a power on the side opposed to banks, corporations and other forms of the new growing power of capital. That Jackson was a typical man of his generation is certain. He represents the spirit and temper of the free American of that day, and it was a part of his way of thinking and acting that he put his whole life and interest into the conflict. He accomplished two things of great importance in the history: he crushed excessive state-rights and established the contrary doctrine in fact and in the political orthodoxy of the democrats; he destroyed the great bank. The subsequent history of the bank left it without an apologist, and prejudiced the whole later judgment about it. The way in which Jackson accomplished these things was such that it cost the country ten years of the severest liquidation, and left conflicting traditions of public policy in the Democratic party. After he left Washington, Jackson fell into discord with his most intimate old friends, and turned his interest to the cause of slavery, which he thought to be attacked and in danger. Jackson is one of the few presidents of whom it may be said that he went out of office far more popular than he was when he entered. When he went into office he had no political opinions, only some popular notions. He left his party strong, perfectly organized and enthusiastic on a platform of low expenditure, payment of the debt, no expenditure for public improvement or for glory or display in any form and low taxes. His name still remained a spell to conjure with, and the politicians sought to obtain the assistance of his approval for their schemes; but in general his last years were quiet and uneventful. He died at his residence, The Hermitage, near Nashville. Tennessee, on the 8th of June 1845.